Christian Laettner played college basketball for the Duke University Blue Devils, starring on the 1991 and 1992 NCAA champion teams. He was the only college player selected for the 1992 United States men's Olympic team, nicknamed the "Dream Team". He is one of only four players to play in four consecutive Final Fours, and the only one to ever start in all four Final Fours. He owns the record for most tournament games played (23) out of a maximum possible of 24 in four years at that time. Laettner's #32 jersey was retired in 1992, making him the sixth of thirteen players so honored by Duke. 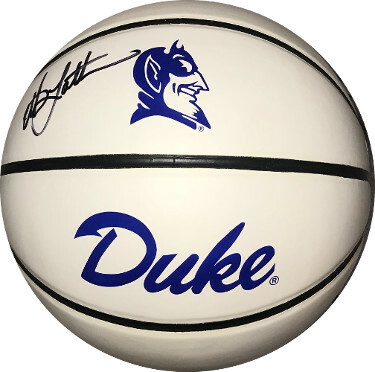 Christian Laettner has hand signed this Duke Blue Devils Logo Full Size NCAA Basketball. JSA Witnessed/In The Presence Hologram and Certificate of Authenticity.